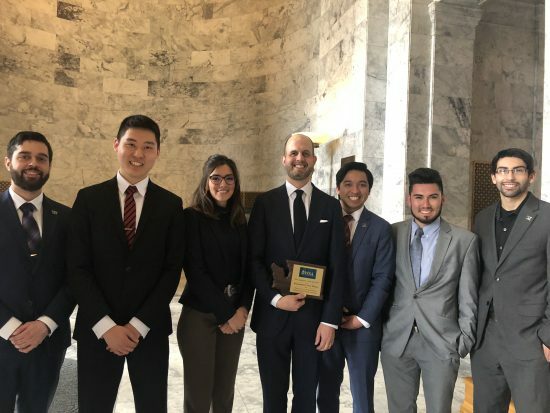 OLYMPIA – Washington state’s largest higher education advocacy group, the Washington Student Association (WSA), recently named Rep. Drew Hansen (D-Bainbridge Island) its 2018 Legislator of the Year. The organization, which announced the award in a Twitter post, represents 130,000 undergraduate and graduate students across the state. “It took a huge team effort to make college more affordable this year, and I’m really grateful for this award recognizing the part I played on the team,” Hansen said. Rep. Hansen’s selection comes at the conclusion of a supplemental budget year that saw big wins for higher education, including elimination of the funding backlog in the state’s principal financial aid program, the State Need Grant, within four years. The program provides grants to students from families with low-incomes to attend college, and its full funding has been a top priority for WSA. Other victories include a student loan bill of rights, completion of a much-needed expansion of computer science slots at the University of Washington, and expansion of open educational resources to help students save money on collegiate course materials. “The WSA aims to build a legislative strategy that increases the affordability and access of our public higher education institutions. Rep. Hansen has consistently offered his assistance to students who advocate in Olympia to reach this goal. His advice and leadership amounted to many great victories for students this year, including a plan to fully fund the State Need Grant over the next four years, which has been a top priority for our organization. We hope to continue working with Rep. Hansen and other higher education champions to continue building the quality of our higher education systems here in Washington state,” said Guillermo Rogel, Jr., WSA’s Executive Director. The information on these pages was created by House staff for legislative purposes and is a historical record of legislative events and activities. None of this material is intended to either directly or indirectly assist any campaign for office or ballot proposition. RCW 42.52.180 prohibits the use of public resources for campaign purposes.